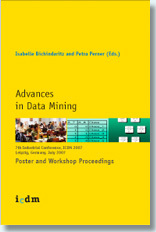 Perner P., Proceedings ENBIS-14, Linz, Austria, September 21-24, 2014. Proceedings IEEE 28th International Conference on Advanced Information Networking and Applications AINA 2014, Victoria Canada, pp. 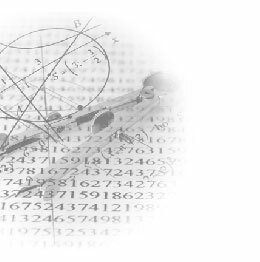 1154-1160, DOI 10.1109/AINA.2014.44. How to Compare and Interpret Two Learnt Decision Trees from the Same Domain? How to interpret Decision Trees? 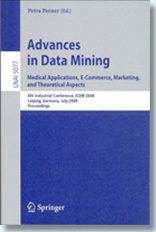 H. Perner and P. Perner, Medical Informatics in a United and Healthy Europe, In Proceedings of MIE 2009 Volume 150, Studies in Health Technology and Informatics: K.-P. Adlassnig, B. Blobel, J. Mantas and I. Masic (Eds. ), IOS Press, 2009, p. 851-855. S. Little, O. Salvetti, and P. Perner, In: A. K .H. Tung, Qiuming Zhu, N. Ramakrishnan, O. R. Zaïane, Yong Shi, Chr. W. Clifton, Xindong Wu (Eds. ), Proceedings IEEE ICDM Workshops 2007, p. 45-51. J. Tischoff, I. Neuhäuser, P. Perner In: Petra Perner and Ovidio Salvetti (Eds. 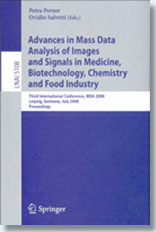 ), Mass Data Analysis of Signals and Images in Medicine, Biotechnology, and Chemistry,Proceedings 2007, p. 220-234. M. Frucci, P. Perner, G. Sanniti di Baja,In: Rosina Weber and Michael M. Richter (Eds. ), Case-Based Reasoning Reasearch and Development, lnai 4626, 2007, p. 419-432. P. Perner, 2. Deutsche Expertensystem Tagung, Hamburg, February 17-19, 1993, Workshop "Fälle"